Locally-defined Nyaunglebin District, colloquially referred to as Kler Lwee Htoo, corresponds to the part of Eastern Bago Region situated to the west of the Sittaung River. This district also includes the government-defined townships of Shwegyin and Kyaukkyi. In terms of the locally-defined Karen Districts, Nyaunglebin is bordered by Toungoo District to the north, Papun to the east and Thaton to the south, and is divided into three locally-defined townships which do not appear on government maps: Hsaw Htee, Ler Doh, and Mu. The region is transected by numerous rivers that drain westwards into the Sittaung River, including the Shwegyin, or Khay Loh River, which was dammed in 2010. The rugged Papun Hills that make up the eastern portion of Nyaunglebin District remain contested mixed-control areas, where the KNLA continues to operate. The Papun Hills drop steeply to the fertile agricultural land on the Sittaung River floodplain in the west. The plains of western Nyaunglebin District and the areas around the larger towns of this District, including Kyaukkyi and Shwegyin, are under firm Tatmadaw control. Shwegyin in the south. A variety of agricultural crops are supported by the varied topography of Nyaunglebin, from flat-field paddy cultivation in low-lying regions to betelnut, durian, peanut and banana plantations in the hills to the east, where many households also practice hill field paddy cultivation on the steep mountainsides. Among these hills, some small areas near the Bilin and Yunzalin Rivers are level enough that flat rice farming can be practiced. The villages in this area tend to be larger than other hill villages. Brief history: In 1992 much of the west of Nyaunglebin was controlled by Tatmadaw forces who were already initiating the “four cuts” strategy. The mountainous east of the district was still hotly contested and a KNLA stronghold. The earliest KHRG reports from Nyaunglebin describe the forced relocation of villagers and the use of relocated villagers for forced labour. In November 1993, Villagers were prevented from celebrating the Buddhist Lightening festival. All villagers were summoned for forced labour to work constructing roads. The summons prevented any large gatherings for celebration while the National Convention was taking place. Villagers, once they reached the age of eighteen, were forced to join the Union Solidarity Development Association (USDA). The USDA was a Tatmadaw supported organisation whose aim was to give legitimacy to the Tatmadaw. Families who refused were fined or arrested. The villagers were told that if they joined, the Association would regularly give them rice, but if they did not, then they would not be allowed to farm their land. Many villages in Kyauk Kyi Township which farmed near KNLA-controlled areas were forced to move in 1993 and forbidden from farming their old land. Some of those farmers were subsequently told that if they joined the USDA, they would be allowed to farm their land again. During this period, KHRG undertook numerous interviews with villagers who were experiencing a range of human rights abuses perpetrated by Tatmadaw forces as they persisted in forcing villagers to conform. In early 1997, in tandem with the offensives which were ongoing in Papun, Eastern Nyaunglebin saw a period of intense fighting. Villagers within areas controlled by the Tatmadaw were ordered to relocate further west. In areas outside the Tatmadaw's control, villagers were shelled without warning, followed by the looting and burning of their villages. Any villagers found afterwards were shot on site. Many of the villagers that fled to the plains found they could not survive because they had no access to arable land. The villagers found little work because other villagers in the plains were similarly suffering heavily under the extortion fees and crop quotas imposed by the Tatmadaw and civilian authorities. At the same time, the hill villagers were used as forced labourers by the Tatmadaw both at the Tatmadaw army camps and on local infrastructure projects. Unable to survive under these conditions, many villagers fled back to their home villages in the hills, only to find that the clampdown on the hill areas continued. In most cases, the hill villages were not rebuilt because Tatmadaw patrols continued to move through the area, destroying whatever they found, including structures, rice stores, crops fields, livestock. Any villagers spotted were shot on site. In 1997 KHRG compiled a list of 35 villages in Shwegyin (Hsaw Tee) township alone that had been completely torn down. The situation worsened for villagers who relocated in order to avoid coming under Tatmadaw control. In 1998 ‘Dam Byan Byaut Kya’ death squads began operating in Nyaunglebin. The death squads operated in small clandestine groups with the purpose of executing anyone suspected of any present or past connection with the KNU or KNLA. By 2001, KHRG reported that these squads were operating less openly, which meant that KHRG no longer received accounts of open murders and corpse mutilation. In 2001 waves of villagers fled into northern Papun to escape the violence that they experienced in Nyaunglebin. During this time, the Tatmadaw executed a dry season offensive operation involving a three-pronged push in Papun District and eastern Nyaunglebin District. 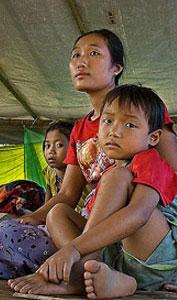 The main attacks came at the beginning of the rice harvest season and forced villagers to abandon much of their crop. Most villagers had little left from the previous year's harvest and the new attacks meant that they would not have enough rice to see them through to the next harvest at the end of 2002. The soldiers destroyed any possessions, school supplies, crops or food caches that they came across. The two Tatmadaw columns reunited and crossed back to the west side of the Bilin River on November 27th 2001, then returned west into Nyaunglebin District . As a first step towards future discussions, the KNU and the SPDC declared a verbal ceasefire in January 2004. Pursuant to the agreement, both the KNU and the SPDC reportedly ordered their military units to cease offensive operations. Peace talks were held again in February, but no agreements were made regarding the delineation of territory, the return of villagers to their villages, a cessation of forced labour, or the ending of any other human rights abuses. Instead, the Tatmadaw used the ceasefire as an opportunity to resupply its troops and to improve road networks, without fear of ambushes by the KNLA. After witnessing Tatmadaw units continue to abuse local villagers, the KNLA attacked the Tatmadaw during the first month following the Gentleman’s Agreement. The attack resulted in several Tatmadaw soldiers being killed or wounded, while the KNLA made off with 39 weapons and some communications equipment. The KNLA withdrew their forces to the mountains after demolishing the camp's arsenal. At any other time, the attack would have been seen as a substantial victory for the KNLA. However, the ceasefire negotiations that were underway in Moulmein were immediately called off and the SPDC issued statements of outrage over the attack. The KNU then reissued its orders not to attack Tatmadaw units if they did not attack KNLA units. On March 28th (2004??) KNU leaders went to Myawaddy and returned the weapons seized in the attack . The terms of the January 2004 Gentleman’s Agreement specified that Tatmadaw forces in Nyaunglebin District were to limit their activities to patrolling the main roads. Instead, between January 2004 and June 2005, the Tatmadaw established seven new Army bases in the district, and took administrative control over several camps formerly controlled by the cooperative Democratic Karen Buddhist Army (DKBA). These camps were used to send Tatmadaw patrols further into remote areas of the district, and increased its ability to force villagers into Tatmadaw controlled areas and consolidate control over eastern Nyaunglebin During this period fighting intensified between the Tatmadaw and DKBA forces and the KNLA. In April, the KNLA attacked and overran DKBA bases at Kyaw Pya and Maw Lay in Mone township. The Tatmadaw subsequently withdrew the majority of DKBA troops. All DKBA camps in the area were taken over by units from Tatmadaw battalions, though a KHRG researcher in the area reported that some DKBA soldiers had returned to the area to assist the Tatmadaw units. In September of 2005 the Gentleman’s Agreement was again broken when the Tatmadaw attacked the 9th Battalion headquarters of the KNLA 3rd Brigade situated on the Shwegyin River in Nyaunglebin District. Civilian villages were indiscriminately shelled, forcing most to flee. KNLA units sporadically shelled the Tatmadaw troops and made preparations to lay landmines if they should attempt to cross the Shwegyin to pursue the villagers. As a result of all these activities, the Tatmadaw forces did not cross the Shwegyin, and withdrew from the area by the beginning of November. With the Tatmadaw cleared, the villagers rushed back to complete their rice harvest, which was already overdue. Those whose fields were west of the Shwegyin River harvested their crop at great risk because Tatmadaw forces left landmines which the KNLA had managed to only partially clear. Even as the villagers returned to complete their harvest, on November 16th 2005 Tatmadaw authorities to the west ordered everyone in four village tracts to clear the scrub along both sides of the Shwegyin-Kyauk Kyi, a distance of at least 50 kilometres (30 miles). The district has had a heavy Tatmadaw presence for many years before 2006, where sustained military occupation was mostly limited to areas alongside vehicle roads and in the plains. KHRG has documented instances where the Tatmadaw has targeted civilians and villages in the hills, as a method of combating KNU and KNLA forces. Between 2006 and 2008 the Tatmadaw increased its military presence in Nyaunglebin District as part of its broader northern Karen State offensive against the civilian population. Beginning in February 2006, the Tatmadaw began investing extensive resources into consolidating control of the area as part of a wider offensive in northern Karen State, which had begun in Toungoo District in late 2005 where some of the worst abuses committed by Tatmadaw since 1997 took place. Regular tortures occurred against village heads as a form of intimidation, villagers were herded into relocation centres after their villages were burned to the ground, and all food was typically stolen. Nyaunglebin District saw a reduction of Tatmadaw operations in some areas at the end of 2008, and for the first six months of 2009, many of the frontline positions once occupied by Light Infantry Division (LID) #101 remained empty, while Military Operations Command (MOC) #1 mostly confined its operations to areas near major roads in Nyaunglebin's northern and central Ler Doh and Mone townships. However, the Tatmadaw continued its efforts to consolidate control of Ler Doh Township and, during January 2010, Tatmadaw battalions controlled by MOC #10 were responsible for the displacement of at least 2,000 people. Internally displaced villagers attempting to evade Tatmadaw control became unable to regularly access farm fields or gardens, exacerbating cycles of food shortages set in motion by the northern Karen State offensive which began in 2006. Other villagers, from the only nominally controlled villages in the Nyaunglebin's eastern hills to Tatmadaw-administered relocation sites in the west, report abuses including forced labour, conscription into government militia, travel restrictions and the torture of two village leaders for alleged contact with the KNLA. Current information Recent military activity and human rights abuses The increased Tatmadaw activity in the area, beginning in 2006 and occuring again in 2010, create intense difficulties for villagers. Those villagers deemed to be associated with the KNLA are shot if they encounter Tatmadaw patrols. Villagers in areas near new army camps or active patrols have had to flee their homes, leaving behind food and belongings. These villagers are now unable to regularly access their paddy fields and vegetable gardens. Left unattended, their crops are vulnerable to wild animals, insects, flooding, and weeds. Though villagers attempt to cultivate their crops even with the risk of being shot by Tatmadaw patrols, the difficulty of accessing their fields due to the increased presence of the Burma Army has contributed to severe food shortages in the area. Military forces and units As of the end of 2011, the Tatmadaw units operating in Ler Doh Township were LID (Light Infantry Division) #101 and Southern Command Headquarters units Infantry Battalions #60, #57, and #53, and LIBs (Light Infantry Battalions) #351, #264, #439, #435, #430 and #439. In January 2012, KHRG received reports that the Tatmadaw was repairing roads near the main Tatmadaw army camps in Ler Doh Township, including Ler Doh, Muh Theh and Poh Khay Hkoh army camps using LIB #702, which is under the control of MOC #4, to deliver supplies. Development, business, extraction Located north of Shwegyin Town on the Shwegyin River, the Gkyauk Ner Gha dam initially began in 2001 with the help of a Japanese company locally referred to as "Ya Ta Say." Ya Ta Say pulled out after the survey phase, however due to concerns about the site selected, the SPDC resumed the project alone. According to a short report by Earthrights International, construction has included unpaid forced labour by villagers in the area. When the Burma government built a dam on the Khay Loh [Shwegyin] River, many villages were flooded due to the dam. There are also plans to build a dam on the Theh Loh River. Humanitarian The 2011 rainy season caused many problems for villagers and their crops, which resulted in an increase of food insecurity. During that year, 116 farms in Yu Loh and Gk'Mu Loh villages were destroyed by floods. 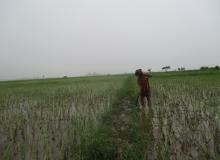 In Ler Doh, there was two months of flooding and many of the paddy plants were destroyed. In the Hoh Lu area, insects destroyed the paddy plants and the villagers could not farm anymore. In the mountainous hill regions, the farmers also could not farm in 40 different places because the heavy rain prevented them from burning the brush on their fields. In Hsaw Hteet Township, villagers could not burn the brush on their fields.